In the years after the Second World War there was a veritable explosion of new independent record companies. Many of these labels specialised in music not adequately covered by the major record companies and particularly the music of America's large urban African American populations - jazz, blues, R&B and gospel - were by the early '50s being serviced by successful independent companies with a grasp of the tastes of the ghetto audience. Chicago's Chess and Vee-Jay, New York's Rama and Apollo, Houston's Duke, Los Angeles' Imperial, Specialty and Modern, Nashville's Excello and others flourished in the fast growing African American marketplace. Jewish entrepreneur Herman Lubinsky founded Savoy Records in Newark, New Jersey in 1942. It recorded hundreds of be-bop jazz sides by the likes of Charlie Parker and Dexter Gordon and enjoyed rhythm and blues hits with acts like Nappy Brown, Buddy Johnson and Big Maybelle. But by the mid '50s it was gospel music which had become its major source of income. Just about every major gospel artist of the '50s and '60s recorded at some time for Savoy and its massive repertoire included acts like the Caravans, Roberta Martin, The Ward Sisters, The Davis Sisters and James Cleveland (whose 1962 recording with the Angelic Choir, 'Peace Be Still', was gospel's first million-selling album). Before his death in 1974 Herman Lubinsky had earned a reputation for being a man of questionable business ethics, holding back many royalty payments. Tiny Price, a journalist for black newspaper The Newark Herald News, wrote, "There's no doubt everybody hated Herman Lubinsky. If he messed with you, you were messed." In the 1960s as the sales of gospel singles began to wane, albums of gospel songs became the preferred format for black church goers and Savoy released more than any other company. Many were illustrated with photos of the artists featured but many more, 190 at the last count if one counts the albums on Savoy's Gospel, Sharp and Regent subsidiary labels, featured strange, other-worldly paintings form an illustrator known simply by his signature, Harvey. Since the release of those albums, a phenomenon has occurred where the sleeves themselves have gained as much interest as the music they were supposed to market. In books published about the history of album graphic design Harvey is mentioned in revered tones for his prolific contributions to sleeve art. There is even a website, run by American John Glassburner (www.harveyalbums.com) which celebrates the art of Harvey by reproducing all the sleeves - 131 on the Savoy label (including five jazz albums), 43 on the Gospel label, nine on Sharp and seven on Regent - known to be by the illustrator who has today a sizeable cult following. Considering the fascination with his work it is extraordinary how little is known about Harvey. To quote from John Glassburner's website, "There are theories about Harvey. Scholar/collector Eric Majette Jr spoke with Rev Lawrence Roberts, long-time producer for Savoy Records. Rev Roberts said that they never knew the identity of Harvey. Harvey lived in New York and was very secretive. They would send him a title or concept and he would produce the painting. The paintings were not expensive, and they paid him in cash. "I exchanged email recently with an unidentified gentleman who claimed; 'It is believed by gospel music historians that Harvey was Herman Lubinsky, the original owner/producer of Savoy Records.' He said that the Harvey covers stopped when Fred Mendelsohn bought out Mr Lubinsky. He further stated, 'A professional artist did analyze these pictures and determined they were not done by a professional artist but by a male over the age of 65.' I've talked with a lot of knowledgeable people about Harvey and never heard this theory advanced, other than a mention on the Intoxica website that in a Japanese book of jazz albums the Harvey painting adorning the Curtis Fuller album is attributed to 'H Lubinsky'." So what of Harvey's art? You won't hear the music as you scan across the covers, but the likelihood is that you will dream the covers when your head hits the pillow. A strange world of eerie uncertainty could well envelop anyone who cares to take time over the collective album art of Harvey. Besides his actual identity, the most intriguing question the work of this faintly autistic ingénue poses must lie in whom or what inspired Harvey's artistic decisions. Whatever the influences, the collective strength of the work lies in the fact that the paintings employ a very limited visual language, one which is delivered in a gaudy, illustrative style, serving only to create a decidedly rose-tinted view of the niceties of being a Christian. With a remarkably sure eye for composition and visual hierarchy, Harvey consistently delivers aesthetically pleasing album jackets which offer the listener a very literal interpretation of Scripture. It suggests that there may have been a perfunctory (verbal?) brief from the record company, possibly a short turn-round time for production of the cover artwork and almost certainly that the artist was located within some kind of modern, non-conformist feel-good tradition - one where off-the-shelf solutions would keep his or her audience from asking awkward questions. A 21st century eye cast over the oeuvre might have the opposite effect. The typography - without exception in a secondary, informative role - has no persuasive emphasis allocated to any part of the text - an indication that the titling would have been chosen once the printer had been instructed and that it was hardly regarded as a design issue. It was no doubt left until the production stage, utilising an anonymous serif font in capital letters; the rule, unmistakably image-first. It was a question of interpretive image-building for the artist, rather than mere design. But was there a marketing strategy at work? Quite possibly the only guidance for the artist would have been the title itself. It is worth noting that those qualities deemed to be 'Harvey' emerge from a body of work built up over the years and by default only now being recognised as distinctive. It is hard to tell if the artist was ever exposed to the Early Masters, say Byzantine aesthetics, the Pre-Raphaelites or any of the great historic art movements. Certainly, there is no ancient mystery here, no catholicism, nor high church, no orthodoxy, no apocalyptic vision. This is someone who studiously avoids hell and damnation, most of the Old Testament and all of Revelation in a quest to sanitise the non-conformist theology which is being pressed onto vinyl. Except that this would be a contemporary reading, philosophical posturing. We can recognise a rigid adherence to certain base rules of symbolism. Where the album title offers up a clue here and there, the painter arbitrarily chooses stairs, still life, a few angels (more fairy-like than commissioned), the open Bible, thrones, pastoral country scenes, open hands, beam-me-up columns of light - all the classic icons of evangelical triumphalism. And it works. But you won't find stigmata, or the angst-ridden perils of a Durer Crucifixion. You are meant to feel cosy and warm. 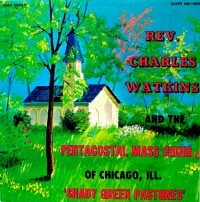 And consistently, that is what is delivered in albums such as Rev Charles Watkins And The Pentecostal Mass Choir's 'Shady Green Pastures' (Savoy MG-14065) with its image of lush green grass and trees and its down-home white picket country church. The same kind of search for reassurance is embedded in the image of the rustic wooden church - Disney-like in its rendition - which fills the cover of 'Little Lucy Smith At The Organ Plays Your Favorite Gospel Hymns' (Savoy MG-14056). Yet perhaps the real story lies in the sub-text of "this-is-the-way-it's-gonna-be" hopefulness - a reaction to the painful struggle for emancipation, all too real in the segregated South and widely given ascent throughout the North Americas even as the '60s rolled out. There is a hopefulness in the simplicity, the palette of almost primary colours; the bold, hot country colours of, say Mexican religious paintings such as San Rafael Arcangel. It is unlikely to have been deliberate strategy; more an unquestioning innocence which, these days, would be taken as a marketing ploy, but which, it seems, simply evolved over the years and through the loyalty of Savoy Records to the artist. In almost every album jacket, we find description rather than allusion, justification rather than evocation. The result is a naive, unsubtle visual concoction, a rare schizophrenia - somewhere between the literal, descriptive folk approach of an infant Norman Rockwell and the ambient surrealism of a very old Renee Magritte. It is a juxtaposition which dubiously sets them apart artistically within the genre, yet also plays to strength as a form of creepy, sci-fi realism. There is certainly no intimacy and little actual presence, just formula. This lack of a romantic or truly narrative interpretation of whatever subject is being represented does, however, reinforce the notion of how central is even the most naïve symbolism to our faith - no more dramatically demonstrated than in the relentless use of the Cross of Christ. Harvey features the empty cross in one form or another in three-quarters of all his work. And it is not merely used as a filler. 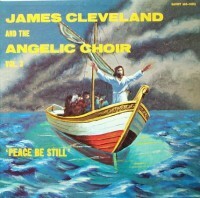 On James Cleveland And The Cleveland Singers' 'The Sun Will Shine After A While' (Savoy MG 14085, 1963) we have a giant, stylized rising/setting sun and, as the strongest focal point, placed right in the middle of the sun, we find a cross. 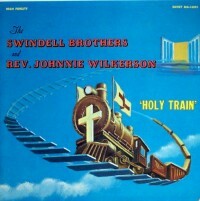 In the image used for The Swindell Brothers And The Rev Johnnie Wilkerson 'Holy Train' (Savoy MG 14090), a train snakes its way across an almost cloudless sky - and there, proudly fixed above the bullwhacker, a large, empty cross; no lateral dimension, no visual sophistication, yet somehow, a peculiar, child-like logic. What we have here is an unwavering belief in the symbol, and in every possible excuse to drive its message home. Admittedly, these are difficult, compound concepts to get across and perhaps to Harvey it would have made total sense to state the obvious in the simplest of ways, employing metaphor in place of parable or explication. Yet the danger with this approach - and ultimately with judging such a body of work in total - is one of over-simplification in the mistaken assumption that artistic innocence is a virtue. Its power may well be in metonymic assertion, but it can also be responsible for a peculiar form of misunderstanding. Take a favourite form of the cross, Harvey's insistence on fore-shortening: 'Out On A Hill' - James Cleveland With The Gospel All-Stars (Savoy MG 14045, 1961) for example, or 'It Was The Blood' - The Roberta Martin Singers (Savoy MG 14054). The latter takes us into the uncharted territory of the comic strip or cartoon: four alien figures, arms akimbo with the steeply tipped cross looking as if it will topple over onto them. At diverse, crazy angles, two smaller 'T' shaped, incomplete crosses, one on either side, teeter on the brink. All this rests on the crest of a "hill" which looks remarkably similar to a large dollop of blanc mange. You could be forgiven for thinking that the artist was crack-happy at the time. What sets the seal on the image is the enormous tear drop of blood perfectly emanating from the centre of the main cross members. Note that this is a cross sans The Christ, reduced to crude illustration and turned into a graphic symbol. None of it would make sense, unless, that is, you have been steeped since birth in such iconography and had also gradually absorbed the emerging permissiveness of the flower-power decades. 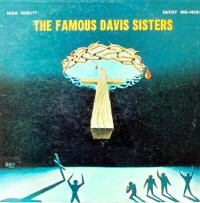 We see the same device again in the cover for 'The Famous Davis Sisters' (Savoy MG 14051), this time with a knowing nod in the direction of Stanley Kubrick's 2001: A Space Odyssey - the high, suspended cross, part garlanded, the deep space colours and hint of a giant planet in the background, and the ubiquitous shadows of animated back-lit stick figures spread out in worship and fear across a grey-blue moonscape. It suggests that Harvey may have had access to the most celebrated rendition of the form in Salvador Dali's painting of Crucifixion Of St John Of The Cross. But it begs the question; other interpretations of his world lie in wait. Dutch art historian H R Rookmaaker points out that Dali's Crucifixion Of St John Of The Cross was named after a heretical 16th century mystic who had a strange conception of a cross hanging over the world but not touching it, posing the question, Did Christ not die for this world, for the people of this earth, including their material concerns, their daily needs, for normal human life, or was his work spiritual in a solely mystical sense, out of this world?' On many of the album covers, the cross does not touch the ground, it is not earthed. What may be at stake here is that Harvey's position, however much an accidental endorsement of a particular view of spirituality, is far more akin to mysticism or science fiction. No hovering cross for us. Does it matter? For those of us who have grown up with the gentle-Jesus-meek-and-mild soft-focus, white-faced Victorian images straight out of a King James version re-print, it is no bad thing to be confronted with a set of unambiguous pictorial proposals which ostensibly give us the visual headlines. The fact is, however, that the covers had a job to do, and Savoy Records, obviously satisfied with their artist (allowing for the unwitting visual repetitions) were not averse to a spot of pragmatism. One of their more eccentric decisions seems to have been the re-use of a cover now and then to sell two very different releases. 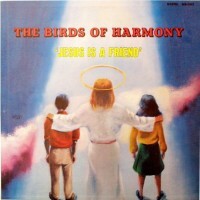 In Birds Of Harmony's 'Jesus Is A Friend' (Gospel MG 3033) we see the central figure of a red-haired Jesus with his back to us and his arms outstretched around the shoulders of a boy and a girl, who are also looking away from the viewer. There is the recognisable beam of light from Heaven enveloping the figures and what can only pass for the ice-crystal streams of pink cloud from a high-flying jet, though the latter may well be an unintentional association. Clearly deliberate is the very large halo around the head of Jesus and the fact that the trio appear to be floating in the air. Interestingly, the halo here is one of the few acknowledgements of artistic tradition. The point is, however, that this exact same image adorns the sleeve of Dorothy Norwood And The Dorothy Norwood Singers' 'A Bereaved Child' (Savoy MG 14190, c 1967). Who knows how forgiving an audience Savoy was reaching at the time, or if, indeed it mattered to them at all? Yet there were portents of change by the middle of the decade: a more experimental approach to typography, with some design thinking going on, as in The Famous Caravans' 'Choose Ye This Day' (Gospel MG 3049). It is contemporary typography on two lines, justified, with "Caravans" a dominant feature in the top third of the frame. Here, too, is the deeply embedded sinecure, the hall-mark visual explanation - yet surprisingly, this particular illustration at least offers us a choice. The image is of a street front facia; to the left, one half of a bar, identified by the "VERN" of tavern, cowboy-style swing doors and a very large street sign of a beer mug - adjacent to a cross on the canopy of a contemporary church facia. It's make-up-your-mind time. Here at least, and almost for the first time, is an attempt at allusion. Such a device was new in Harvey's work, yet it is almost incidental. It is not the point of the cover. And this is the charm, the appeal. Most of the time, Harvey offered a complicated world his child-like vision and made the listening believable. It is likely that he saw sleeves as signposts. Even although by 1968, photography was making an appearance on certain Savoy sleeves, possibly signalling an end to the Harvey years, we cannot escape the persistence of what would shape our memory of the music. 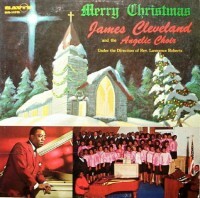 In James Cleveland And The Angelic Choir's 'Merry Christmas' (Savoy MG 14195, c 19618) a shot of James Cleveland at the keyboard sits alongside a picture of his choir in the lower half of the album cover, but they have to share the honours with a sugar-coated illustration of a white Christmas church snow scene. No illustration of angels, it has to be said, but still the proud and classic reference to a truly biblical perspective in the shape of a very large, four-pronged star over the church - as if this was the very place where it all happened. Perhaps, with the long-player on the deck, and the sleeve on your lap, that is exactly the way it was. Phil Thomson is both a renowned lyricist, having written many songs with Adrian Snell, and a well known graphic designer with many album sleeves to his credit. My brother and I inherited an actual painting done by Mr. Williams. We would like to share pictures of it with his family. I am happy to pass this information along to the family. Please let me know and thanks! So I see that two people have said they knew Harvey. Was this ever proven? I really love Harvey album covers. I wish someone would do a book dedicated to his work. Really special artist. Thank you for your article and your research .. here is a video I made in Paris at Jean-francois Villetar, a great collector of jazz and who owns a large part of gospel albums illustrated by Mr Harvey. The illustrations are magnificent .. I thank Jean-Francois for his welcome, for sharing his passion and having taken the time to provide me with all his explanations. A special thanks to Latif who is also a great collector (Latif soul discoveries) who met Jean-Francois. The "mysterious" Harvey is no mystery to me. He was my older brother. I remember the album covers (some of them). He would bring examples of them to the house to show our father, my mother and myself. I was in my teens, he was in his 30s. He was a graduate of Music and Art HS in NYC and the Art Students' League where he taught. He is buried on Long Island. His son Keith has also posted. I have tried to get some information on your brother for close to 30 years. My good friend worked for Savoy Records and we could not find the original Artwork for the album covers. We are looking ahead to a Museum on Savoy Records and to track down and original cover would be wonderful. Please let me know if any still exist. My brother and I inherited a painting done by your father. We would like to share photos of it with you. Wonderfully, literate, descriptive, colorful article. Thank you so much!